well as optimize internal settings. It also offers functions for individual adjustment of the operating system that work using Windows’ own settings functions by supplementing or grouping them in different ways. You can use the BASIC module for free. In the PRO module the number of errors will be shown but they cannot be fixed. 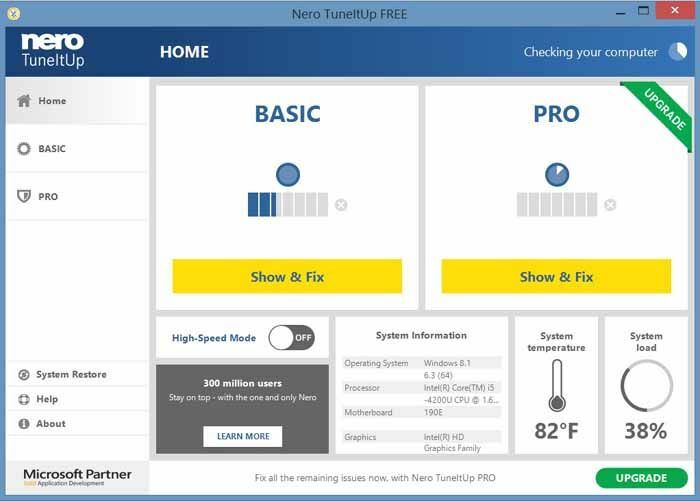 When Nero TuneItUp PRO is activated, all of the functions in both modules become available. During startup Nero TuneItUp automatically analyzes all weak spots and problems in your system and lists them. The intuitive interface makes it possible to fix problems while maintaining a clear overview.